I developed this game as part of a 4 person team in a 36 hour game jam. Dungeons of Rogueness is a Rogue-like with procedurally generated dungeons. The goal is to defeat all enemies in the dungeon. The dungeon has a number of rooms, which are not connected to each other. Instead, the player has a certain amount of steps they can take in each room before getting teleported to a different one. Therefore, the player needs to plan their strategy of how they are going to approach each room and defeat the enemies in it. An added element of strategy that emerges is to gauge the difficulty of the room and choose to avoid enemies and collect more items in easier rooms first, rather than trying to tackle every room head-first. 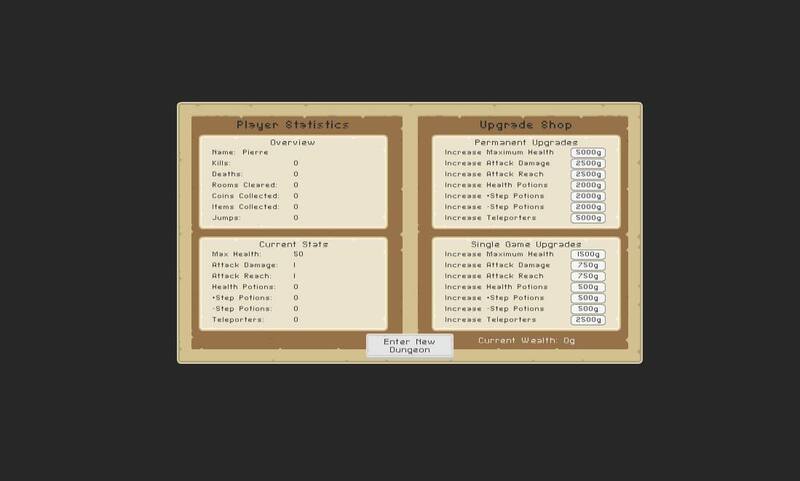 The player can also upgrade their skills at the start of the game with gold collected from the previous playthrough. The team liked the idea and decided to continue development of the game after the game jam in their spare time as well. I developed the procedural dungeon generator, and contributed to developing the character controller, the enemy AI, the teleportation mechanic and the combat mechanics.